American Psycho reminds me a lot of Fight Club. It injects me with a similar does of hopeless skepticism toward everything. Patrick Bateman (Christian Bale) deals with everything with skepticism. His skepticism drives him to such reckless carelessness that he starts chopping people to pieces. Skepticism is one of the ways people deal with life when they don't know God. When children grow up into adults, they espouse the world's taintedness and become skeptical. But God restores people to a more childlike, content, unconditionally joyful outlook on life. Sometimes skepticism is funny, as Bateman demonstrates. He goes through life with a smirk and an ax. This might seem funny at first, but it gets old. This kind of outlook has to break a person down eventually. In what way will such a man break down? He can either fall toward God or away from God. A skeptic sees the dark irony in everything, which can be funny, sort of, maybe, sometimes. Eventually such an outlook must drag a person down into a depressed, lethargic pit. Most people can point out what's wrong with the world. Few people can tell you with conviction what is the world's ultimate Good. Bateman has an exceptional talent for finding out what's wrong with things. He is so consumed with a sense of wrongness that he lashes out with knives, axes and nail guns. Such is the utter uselessness of skepticism, that it points out everything wrong with the world while it offers no solutions. Ultimately a a man's skepticism might justify unheard of atrocities in his mind because, after all, what difference does it make? I love this movie...not only because Bale has that naked parts, but it was nicely done. I wouldn't want to meet a character like that in real life, would you? Nice review. You're right about the lashing out; I don't know if I ever phrased it that way, but his psychotic outburts really are a frustrated lunge at what he can see as wrong in the world. His personal lack of identity and satisfaction need to be compensated for somehow. i loved the movie. but the ending confused me a lot. That was a great review. 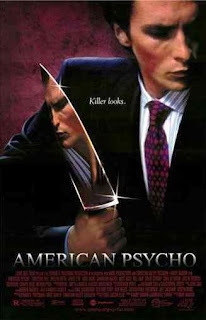 American Psycho bored me to tell you the truth. Watching a yuppie cut up prostitutes right after talking about terrible music like Phil Collins. Not my cup a tea. I do believe you can draw parallels between this film and Fight Club, but Fight Club is worth a second and third and fourth viewing while American Psycho deserves a free rental if that.